The Food and Agriculture Organization of the United Nations (FAO) has organized a series of Perspectives on World Food Day. 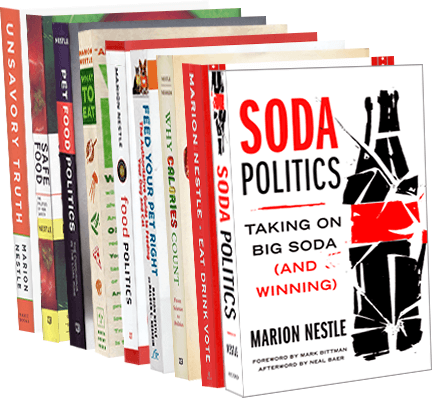 Mine is titled “A Push for Sustainable Food Systems.” It’s illustrated with cartoons from Eat, Drink, Vote. From my perspective as a public health nutritionist, this year’s theme for World Food Day,Sustainable Food Systems for Food Security and Nutrition, seems especially appropriate. Food insecurity and obesity are the most important nutrition problems in the world today. Each affects roughly a billion people. Each is a consequence of food system inequities. Most countries produce or import enough food for the needs of their populations, but do not always ensure that it is equitably distributed. Because many people lack resources to obtain adequate food on a reliable basis, hunger is a matter of politics. Political conflict, insufficient responses to natural disasters, corrupt institutions, and inequalities in income and education constitute the “root” causes of malnutrition. It’s not enough to distribute food to hungry people. Governments should take actions to redress system inequities that lead to hunger in the first place. Similarly, the causes of obesity go beyond the poor food choices of individuals. Obesity is one result of an industrialized and unsustainable food system that treats agricultural products as commodities, uses most of these products to feed animals or produce fuel for automobiles, provides little support to farmers who produce fruits and vegetables, and provides endless incentives for overproduction. The result is an overabundant food system dependent on the sales of meat and obesity-promoting snack and beverage products, and on marketing such products to populations in low-income countries. Much evidence confirms that individuals find it difficult to resist food marketing pressures on their own. If countries are to prevent rising rates of obesity, governments must intervene. The extent to which governments should be involved in the food choices of individuals is a matter of debate. Making sure people are fed is one function of government; another is promoting public health. Because research demonstrates profound effects of food marketing on personal dietary choices, governments can set policies that make healthful choices the easier choices such as promoting fruit and vegetable production and setting limits on marketing practices, not least to reduce health care costs. Whether the world can continue to produce enough food to meet growing population needs is questionable, but the need for sustainable food systems is not. Governments must support food systems that provide farmers and workers with a reasonable standard of living, replenish soil nutrients, conserve natural resources, and minimize pollution and greenhouse gases—and promote health. Governments and corporations must go beyond perceptions of food as a fungible commodity to understand food as an essential source of life, and firmly link agricultural policies to those for health, labor, and the environment. If politicians cannot commit to policies to reverse global warming, then ordinary citizens will have to take action. And they are rising to the occasion, as exemplified by today’s burgeoning food movement.